- 34046 'Braunton' (Taking on the identity of scrapped Bulleid 34052 'Lord Dowding'. Herston Works will also be open, where 34072 '257 Squadron' can be seen, tantalisingly close to completion. All in all, a veritable feast of 'Bulleid' Locomotives! I am pleased to say that the 'Strictly Bulleid' Steam Gala at the Swanage Railway (Friday 31st March to Sunday 2nd April) was a resounding success . There was good weather each day and I understand that the number of visitors over the 3 Days exceeded all expectations. Each of the 'Bulleid' Locomotives (3 'Original' and 2 'Rebuilt') ran well and the experience was worth every penny of my '3 Day Adult Rover' Ticket. There were some particular 'volcanic' performances from Original 'West Country Class' 34092 'City of Wells' (affectionately known as 'The Volcano'). Obviously, I was very pleased to see 'Battle of Britain Class' 34053 'Sir Keith Park' running on 'home metals'. There was also the experience of being able to run beyond Norden, towards Wareham, on the Main Line connection as far as the River Frome Bridge (approx. 4 miles beyond Norden). Regular Passenger Services are expected to run into Wareham itself from June this year, for a '2 year Trial Period'. 'Golden Arrow'; Man of Kent'; 'London-Paris Night Ferry'; 'The South American'; 'The Cunarder'; 'The Royal Wessex'; 'Atlantic Coast Express'; 'Oriana P & O Orient Lines'; 'Union-Castle Express'. Last edited by 34053 on Mon Apr 10, 2017 2:55 pm, edited 1 time in total. Each of the 'Bulleid' Locomotives (3 'Original' and 2 'Rebuilt') ran well and the experience was worth every penny of my '3 Day Adult Rover' Ticket. There were some particular 'volcanic' performances from Original 'West Country Class' 34092 'City of Wells' (affectionately known as 'The Volcano'). If my memory serves me correctly, City of Wells is fitted with a Geisel Ejector instead of a regular blast nozzle​ to improve her draughting and making her ( in theory) cheaper to run so you should find she chuffs a lot louder and harder than any other spam can. "A Giesel ejector is a suction draught system for steam locomotives that works on the same principle as a feed water pump. This ejector was invented in 1951 by the Austrian engineer, Dr. Adolph Giesel-Gieslingen. The Giesel ejector ensures improved suction draught and a correspondingly better use of energy. The existing blast pipe in a locomotive is replaced by several small, fan-shaped, diverging blast pipes, from which the diffuser gets its flat, long, drawn-out shape". The top of the chimney is infact the top of the Ejector. The last numbered 9F, 92250 was trialed with a similar Geisl Ejector when it was built, it improved the engine but the savings is made were small so no other 9F was fitted..... 92250 kept hers up until she was scrapped. Vulcan Bomber wrote: The top of the chimney is infact the top of the Ejector. The last numbered 9F, 92250 was trialed with a similar Geisl Ejector when it was built, it improved the engine but the savings is made were small so no other 9F was fitted..... 92250 kept hers up until she was scrapped. Thank you for the info' VB. Who knows by how much the development of/improvements to, the design of Steam Locomotives would have been progressed, but for the indecent haste at which they were withdrawn and/or scrapped?! I suppose conversion to oil firing (which was in the process of being trialled) was the next obvious step. I only know really what was done with the BR Standard's, 3 9F's were trialed with a screw style stoker, then if you want to read up have a look at the 10 Built with a franco-crosti Boiler.... We also had the Duke of Gloucester, 3 cylinders with Capprotti Valve gear, in for overhaul at the minute this engine could run at just 3% cut off. 'Sir Keith Park' will be visiting the Mid-Hants Railway (aka 'The Watercress Line') for their 'Summer Gala' on Saturday 1st July/Sunday 2nd July; plus Friday 7th July/Saturday 8th July/Sunday 9th July*. This will be another commemoration of the 50th Anniversary the 'End of Steam on the Southern' in 1987 (*actually on the 9th July) - as was the recent 'Strictly Bulleid' Gala at the Swanage Railway. - ''Battle of Britain Class' 34052 'Lord Dowding' [Actually 34046 'Braunton', but renamed for these Events to represent 'scrapped' 34052 - and also to have the unique opportunity to run two, consecutively numbered Locomotives, with 34053]. Note: This Locomotive will be at the Gala for 1st and 2nd July ONLY. As you can see, an amazing collection of Steam Locomotives, including no less than EIGHT 'Bulleid' Pacifics. ''We'll be bidding a fond farewell to Sir Keith Park at the end of the year, so our Autumn Steam Gala will be one of your last chances to travel behind it! No. 34053 has been resident on the Severn Valley Railway since its inaugural run in 2012, and has steamed up many highlights. Some memorable moments include; the Steam and Morgan car challenge in October 2012, and the inauguration ceremony of the loco in August 2013, which involved a flypast from a Spitfire and Hurricane at Bridgnorth. The agreement for operating the locomotive with Southern Locomotives Limited (SLL) has a break clause every two years, with the next renewal date at the end of 2017. We have mutually agreed that the option to renew will not be actioned at the end of this year, with 'SKP' moving to the Swanage Railway for the rest of the locomotive's certificate. This is a mutual agreement with the owning group, and leaves every opportunity for further locos from the SLL fleet to visit in future years. A farewell weekend for the engine is likely to take place in November, with No. 34053 operating alongside No. 34027 Taw Valley for, what could be, the last time. - Great Central Railway (5th- 8th October). - Llangollen Railway (13th - 15th October). The Locomotive will then return to the Severn Valley Railway until January, which is when 'Sir Keith Park' will 'return home', to the Swanage Railway. 34053 wrote: I am pleased to say that the 'Strictly Bulleid' Steam Gala at the Swanage Railway (Friday 31st March to Sunday 2nd April) was a resounding success . There was good weather each day and I understand that the number of visitors over the 3 Days exceeded all expectations. 'Sir Keith Park' is due to leave the Severn Valley Railway and return to the Swanage Railway on 11th January. Initially, the Locomotive will enter Herston Works to be checked over, having clocked up approx. 35,000 miles at the SVR and has visited other Preserved Railways as a 'Guest Locomotive' at their various Galas. SKP's time at the SVR also means that 'she' is now half way through 'her' 10 year 'Boiler Ticket' already! Looking forward to seeing 34053 running on 'home metals' again. May she have a safe journey back home. Hope she has a good time running on the Swanage Railway. Glad I saw, photographed and rode behind her at the Nene Valley Railway. 'Double Click' on the first photo and then follow them through to read each caption and date. 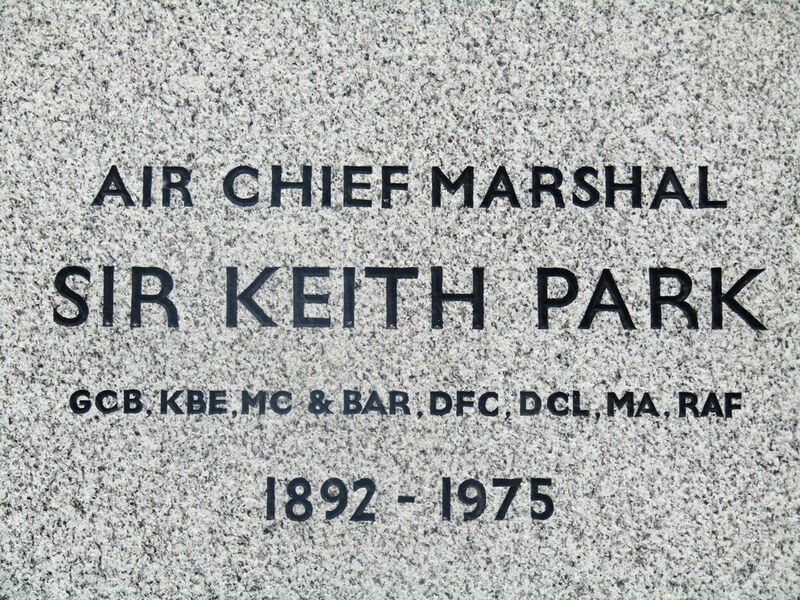 'Sir Keith Park' made the return journey from Bridgnorth to Swanage, by Road, on Thursday 11th January (as scheduled). The Locomotive entered Herston Works to undergo a 'check over', before returning to Service on the Swanage Railway. Minty4371 wrote: Thank you Ray. It stands for a 'Piston and Valve' Examination, Robert. Just to check that there are no possible problems in that 'department'. Thank you for your continued interest in SKP. Thank you for the reply Ray. Hope everything goes well and no problems are found. Hope 257 Squadron is running soon as well. Thank you, Dougs. I'm looking forward to seeing your 2.5'' gauge version of 'SKP', in due course. 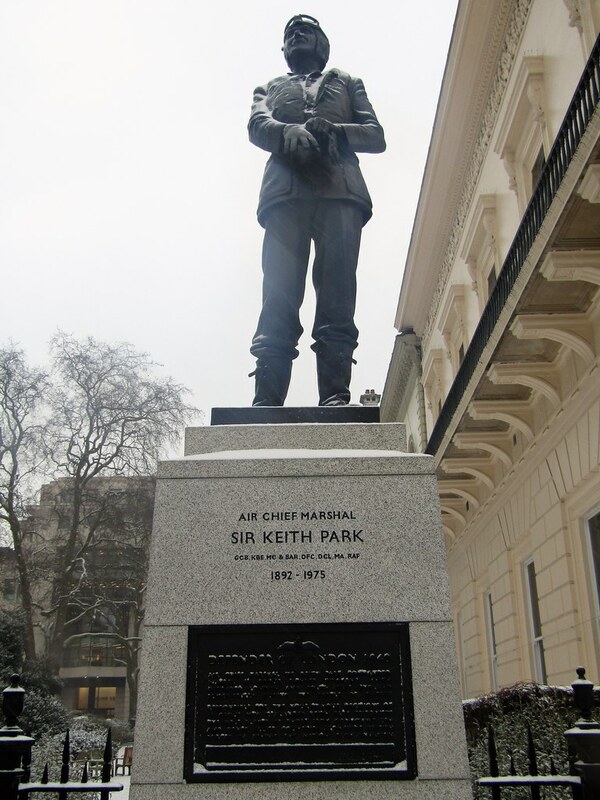 I was privileged to be invited to the unveiling of both the 'Temporary' statue of Sir Keith Park (on the '4th plinth' in Trafalgar Square) on 4th November 2009 and also the above 'Permanent' statue (in Waterloo Place) on 15th September 2010. 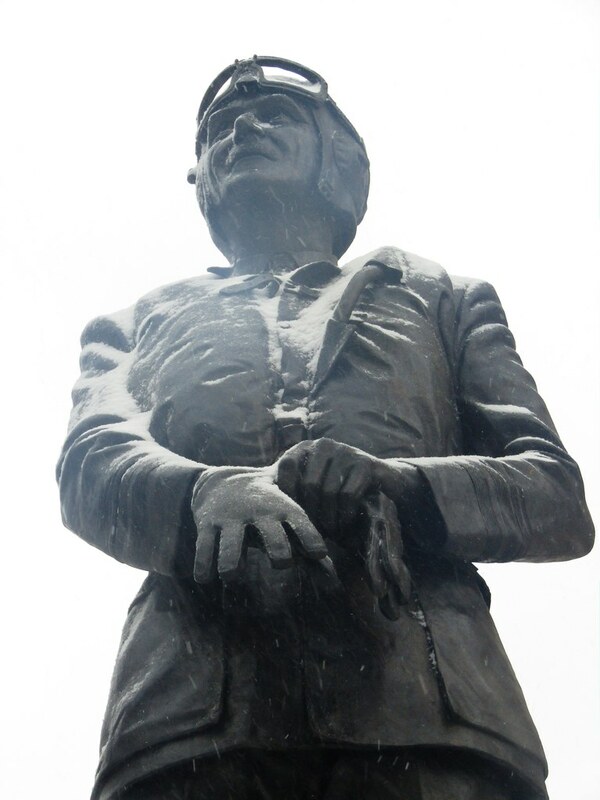 Both events were attended by many of the remaining Battle of Britain Pilots at the time. Sadly, with the passage of the years since, the numbers are now reduced to single figures (just 7 when I last looked).